Kadapa, March 26: The Lok Sabha Elections 2019 dates are out and the model code of conduct in place, political stalwarts are all up against each other. 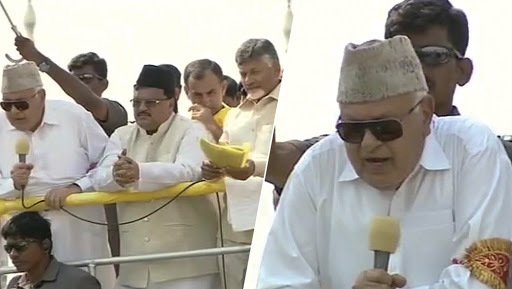 In the latest, National Conference president Farooq Abdullah on Tuesday hit out at YSR Congress chief Jagan Mohan Reddy and questioned him how did he possessed Rs 1,500 Crore in his political career? He even asked him whether he had a treasure buried somewhere, that must have been from a loot? Addressing an electoral rally in Kadapa, Abdullah asked, “I'd like to remind Jagan what he said to me after his father's death, he said that if Congress makes him CM, he is ready to give them ₹1,500 cr. How did he get so much money? Does he have a treasure buried somewhere, that must have been from a loot.” Farooq Abdullah Slams Govt over Air Strike, Ram Temple.